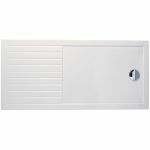 Our walk in shower trays with drying area offer a stylish, safe and practical solution for those wanting to compliment a wet room style shower space. 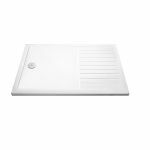 The most common walk in shower tray sizes are 1400x900mm, 1600x800mm and 1700x800mm. Dedicated walk in trays rather than just a standard rectangular offering are unique in that they incorporate a raised drying area. These have grooves that drain the water away but also double as a safety tread for your feet to grip on thus improving safety. Most walk in trays including those from Phoenix include a large 90mm water drain as part of the design. This drains water away quickly and once again reduces the chance of slipping.